I firmly believe that it does not matter where you live, the tax office is designed to have the most complex set of systems and rules possible in order to dissuade you from paying the correct amount of tax, or indeed, any tax at all. We moved six months ago, I have been trying to register my paltry little business here for the last three of those months – the first three were spent waiting for my tax bill from the UK and then waiting for a letter from the UK to say I had paid all of my tax and yet more waiting for a tax rebate of … Wait for it … £27.82. Yes, sent by cheque to Sweden, where I had to pay almost half of that in charges to bank said cheque. I have filled in 28 pages of forms; spent vast quantities of cash bribing the boys to sit still in the waiting room where I queue and repeat my story to another helpful, yet weary, tax office person; and hours travelling to and from the tax office (which incidentally today, I found out, was not the closest one to where we live after all). I nearly broke the iPad again when I read that, I am not sure what kind of special invoices are needed to prove I work here? Should I put the Swedish flag on them? Buy the paper to print them on from IKEA? Eat meatballs and lingon while writing them? 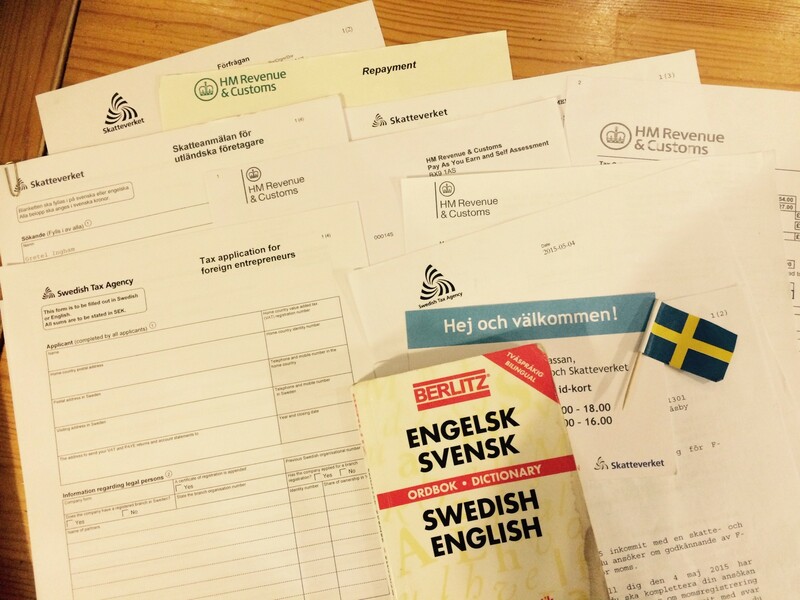 It is clearly not enough to to live in the country, run your business from a Swedish address, have Swedish clients and want to pay tax to the Swedish government sooooooo much that you persist in returning to the dreaded tax office to fill in a third copy of the form because lo and behold, I mistakenly crossed no instead of yes on section 7b of the snappily titled Tax application for foreign entrepreneurs. Maybe, just maybe, by the time December comes, I might have it all sorted and then as a special Christmas gift, I’ll get my tax and VAT bill. Yippee! Yeah, I thought it would be simple, but apparently not… Oh well, hopefully I am done now and can look forward to the impending tax bill! !